AMD has put an official end to the debate surrounding Windows 10's thread scheduler and Ryzen's lower-than-expected 1080p gaming performance. In an official statement posted on the AMD gaming blog, the company says "the Windows® 10 thread scheduler is operating properly for “Zen.”"
The statement continues to say AMD "do not presently believe there is an issue with the scheduler adversely utilizing the logical and physical configurations of the architecture." As for reported performance deltas between Windows 10 and Windows 7, AMD says that they "do not believe there is an issue with scheduling differences between the two versions of Windows", and that any performance differences are simply attributed to the software architecture differences between 7 and 10. AMD has also taken the time to address reports suggesting simultaneous multi-threading (SMT) was having a negative performance impact in some games. The company says they expect SMT to provide a "neutral/positive benefit", and quote a wide range of games where this behavior is seen. AMD goes on to suggest that some game optimizations for Ryzen may be possible. It's fantastic to see AMD directly addressing the community in this way, putting to bed several controversies and issues websites like ours have been investigating over the past few weeks. There are still question marks over what architectural aspect of Ryzen is causing lower-than-expected gaming performance, but we can safely rule out the Windows 10 scheduler as the cause. Ryzen is more 2x4, rather than 8 independant cores. It adds latency between the CCXs. Fluffmeister, SamuraiSamson and penn919 like this. Lower performance in games is caused by inter-CCX threading, as investigated and found out by PC perspective. Those are 8 independent cores, just not all interconnected directly, you're messing the concepts (AMD could be seen as inter-connecting all cores through two inter-connected fabrics; whereas Intel, judging by the core-core latencies, seems to be connecting all cores to one fabric). And that PCPer's analysis doesn't explain the sometimes worse performance with SMT enabled. Hardly the case. CPUs and streaming-GPUs are totally different monsters in concept. While CPU-cores can each be running different programs at a time using either shared or independent resources; streaming GPUs mostly run the same instruction at a time, with each core operating that instruction with a different portion of a big dataset (think of a big matrix evenly distributed across all GPU-cores). In the case of GPUs: the scenario can be seen as GPU A having the bottleneck at low resolutions in an inferior processing power compared to GPU B; and in the case of high resolutions, GPU A being superior to B due to B having a memory bandwidth bottleneck. These are examples of possible reasons to these scenarios and aren't guaranteed to be the actual causes. It's amazing how AMD says one thing, and other people continually say/think another. AMD said Polaris was a mainstream part, yet people were suggesting performance was close to the GTX 1070 and even the GTX 1080. AMD said Ryzen had Haswell gaming performance, and well, here we are again. "There are still question marks over what architectural aspect of Ryzen is causing lower-than-expected gaming performance"
Obviously people over-blew Ryzen, although it is still a great processor. What I don't get is how the difference in performance between windows 7 and 10 is as noticeable as it is. AMD claims that there's nothing wrong with windows 10 but hell, it definitely looks like a problem for Microsoft, who want to get people to upgrade to windows 10. I'm running windows 10 right now and if I had purchased Ryzen I would have gone to windows 7 without a second taught. The real and simple answer is Ryzen has problems and what AMD are saying, is some maybe be fixable through simple application changes that devs can do. Whether a dev decides to make any changes to cater to Ryzen remains to be seen. Microsoft is not the problem. Win 7 is simply designed differentely than 10. Sure ppl can use 7 to get the most out of Ryzen but all your doing is taking a step backwards, like AMD seems to do everytime they challenge Intel. from what I have read, videos are coming out where the 7700k also has performance gains on windows 7, pointing towards some sort of well-conceived but *****ically implemented scheduler in windows 10. AMD Says that it doesnt have a scheduling issue, but thats up for debate, because the "issue" in question isnt really a bug, its just an inefficiency. It was not well thought out at all to release a product with such low bandwidth between CCX modules, and its far more efficient to have the scheduler try to keep things on the same CCX module if possible, which windows 10 doesnt seem to do. Regardless, itll be very interesting to see how the cheapest, (hopefully?) 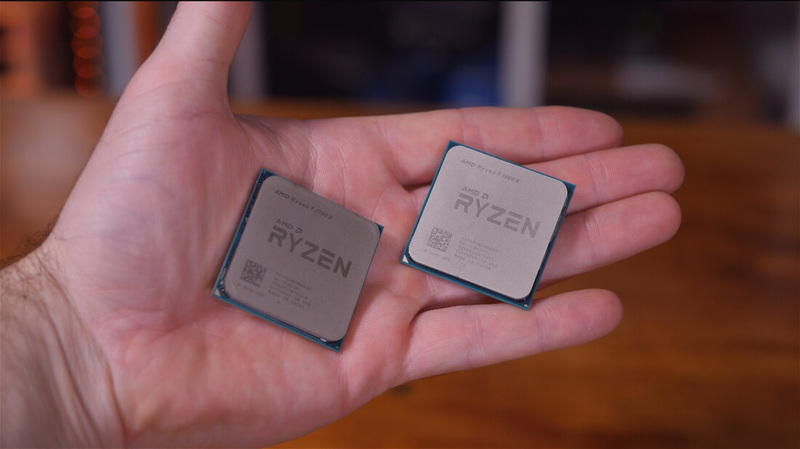 single-CCX chips(ryzen 3) perform compared to i3s/i5s. So the solution to having optimal performance with Ryzen right now is to run Windows 7, yet to get the most out of AMD GPUs you'll need to be running Windows 10 to make full use of DX12... Seems legit to me. Gzzzzzzz .... almost like the battle of the "news fakers", but in any case, there is enough controversy to cause me to steer clear of it. Wouldn't it be nice if the comparisons were required to follow some kind of comparison standard so it would remove all the editorial "opinions" and just get down to brass tacks? Bravo! I'm all for anything forcing Intel prices into reality mode. As a non-gamer myself, the woes with not properly allowing one to shoot an enemy faster than an opponent, oh well. BUT, as I recall AMD processors wouldn't run Photoshop correctly back in the day. Not properly supporting Win 7 is a BIG no no with the world surveillance situation worsening by the hour. And I WILL be watching to see if professional version of Nuance discrete speech recognition software will play nice with these new multi-core AMD offerings. My sense is the ghat any serious gaming-related performance issues would probably doom this 'new kid on the block' rather decisively if not quickly resolved. There are still question marks over what architectural aspect of Ryzen is causing lower-than-expected gaming performance, but we can safely rule out the Windows 10 scheduler as the cause. Exactly opposite. Windows 10 scheduler is buggy but AMD is downplaying issue as that is something AMD cannot fix. "Microsoft's newest Windows 10 works worse with Ryzen than Windows 7 (that we do not officially support because Microsoft told us not to). So Microsoft screwed us again. First they tell us we should focus on Windows 10 and then we discover they didn't bother to fix Windows 10 scheduler issue before Ryzen launch. **** off Microsoft". Also there are no "architectural aspects" outside Windows scheduler and software bugs that cause lower than expected gaming performance. Constantly moving data between L3 caches and different CCX's is causing slowdown. That either scheduler or software issue, or both. any performance differences are simply attributed to the software architecture differences between 7 and 10. Odium and wiyosaya like this. In a way, I find it refreshing that AMD is accepting responsibility for the issue. However, I have to disagree that it is all on AMD - as AMD's statement implies. From my point of view, M$ has released successively slower OSs over time. They have added in all kinds of cutesy graphics and other things over time that are pointless, while eating CPU cycles doing so and adding little to no value to the performance of PCs. Basically, as I see it, M$ has continually added useless bloatware in order to appeal to the visual experience. It is like they want people to think that the OS is doing something extraordinary, when it is really doing the same things it has always done, but is wasting more time doing it. I have an early dual core Opteron based PC that runs XP, and a Xeon 1650 v2 (6-core Ivy Bridge) that was running 7, but is now running 10. From a cold start, I.e., no semi-hibernation because I have hibernation turned off, the Xeon PC definitely takes far longer to come to a usable state than the Opteron PC. I think M$ needs to stop adding cutesy crap that amounts to performance dogging bloatware and make their OS practical rather than attempting to follow a cutesy fad. I want my computer to copy files without showing me some cutesy graphic of how fast it is working simply because those cutesy graphics are a waste of time since they synchronously handshake with the actual copy operation. Like you, after all kinds of problems with "upgrades" for 10 from my PC being left with a black screen and only the mouse cursor showing, to breaking automatic hibernation, and breaking WiFi sharing to the point where even deleting and remaking shared WiFi, I have disabled Windows 10 pro "upgrades" through the policy editor. In the long run, if I were AMD, I would not be so willing to accept responsibility over M$ since it is plain for anyone comparing side-by-side multiple generations of OSs from M$ that they have simply gotten slower over time. BSim500 and wiyosaya like this. Odium, Amet Monegro, BSim500 and 1 other person like this. Solution - Wait for Ryzen 2 and enjoy the Intel price cuts until then. People still going on about Windows 10 lol. There isnt nothing wrong with 10, its simply your computer or you dont know how to use a computer. I can play any game just fine, no performance issue related to 10. Ive used Win 10 since the beginning. Went from Win 7 Pro to Win 10 Pro. Simply did a upgrade. Not a single issue.